I'm not diagnosing Trump with narcissism, just comparing his cartoonish traits with those of Daffy Duck. As I watch Donald Trump as candidate and president and read his tweets, he keeps reminding me of Daffy Duck. A nursing school class on mental health required the students to present on a major personality disorder. One of the students chose narcissism, and her brilliant and unforgettable presentation used Daffy Duck as the subject. Daffy: “Boy! Listen to that! They love me! !” when the audience was actually applauding Bugs Bunny. Daffy: “What!? That rabbit’s name over mine!?! I’m the star! I’ll just see about this.” Daffy Duck was looking at a sign advertising Bugs Bunny’s show that listed, in small print, Daffy Duck as a supporting act. Trump, tweeting June 18, 2013: “Do you think Putin will be going to The Miss Universe Pageant in November in Moscow — if so, will he become my new best friend?” Trump’s bromance with Russia’s Vladimir Putin belies an intense envy. After all, Putin’s house is bigger than Trump’s; he has more money than Trump; and rules as dictator without challenge from a pesky media. On numerous occasions, Trump allegedly asked former FBI Director James Comey and high-ranking national security and intelligence officials to drop the investigation of Michael Flynn’s ties with the Russians. Daffy: After performing, Daffy receives no applause from the audience. He becomes furious, shouts “Ingrates!” and storms off the stage. 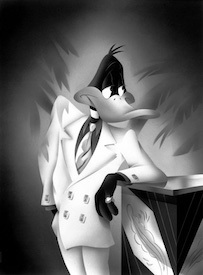 Daffy: Performing numerous tricks to gain the admiration of the audience, he danced an elaborate tap routine, trained pigeons to walk tightropes, tried to sabotage Bugs Bunny’s fame by putting TNT in his xylophone, and finally, blowing himself up with a mixture of uranium, nitroglycerine, gunpowder and gasoline. He finally received massive applause for this final act. Trump staged a post-election victory tour and gloatfest. I’m not diagnosing Trump with narcissism, just comparing his cartoonish traits with those of Daffy Duck. The difference is, Daffy is lovable.